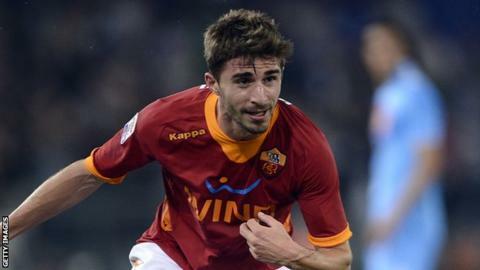 Brendan Rodgers hopes to make Roma forward Fabio Borini his first signing as Liverpool manager later this week. The 21-year-old Italy international worked with Rodgers at the Chelsea academy and on loan at Swansea. Talks between the parties are ongoing and although the deal has yet to be agreed, the potential fee is likely to be an intial £8m, rising to £11m. On Monday Rodgers had stated that he was close to making an "exciting" signing. "We hope to complete a deal this week which will be a real exciting one for the club," he said. "He will be terrific, I'm sure. And the supporters will absolutely love him. "Going forward hopefully we can bring maybe two or three more and then with the group of players that I already have it'll bode really well for us and provide us hopefully with that strength in the group to challenge in every competition." Rodgers has admired Borini since the Italian scored scored six goals in just nine Championship appearances while with Swansea towards the end of the 2010-11 season. The former Parma forward has one international cap and was part of the Italy squad that finished runners-up at Euro 2012. One player who chose not to move to Anfield was new Tottenham midfielder Gylfi Sigurdsson. But Rodgers admitted that it was his reluctance to up Liverpool's financial package to match a more lucrative deal being offered by Spurs that meant the player moved elsewhere. "We didn't lose out because of not wanting to spend the money [on wages]," he added. "We lost out because the manager wasn't prepared to move on it. There's no doubt there'll be other targets and other people that we need to look to bring in. "But we won't lose out on wages. If we feel there's a player out there in the market whose value and worth can add value to what we're doing here then we'll do everything we can to bring them in." However, Rodgers did admit he does not possess endless transfer funds. "We don't have a wheelbarrow load of money, there is not the money flying about people think there is," he added. "There certainly won't be as many signings as is being labelled out there. "We want to work with the great players we have here and make three or four tweaks in relation to the squad that can help the group. We want to be competitive in every game and challenging at the top end."